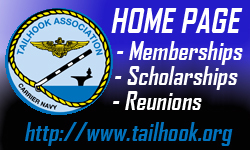 More Photos from the Front at Tailhook 2014Sponsors and Vendors! Richard Parnacott on USS Enterprise, Farewell… and Hail! KenofSoCal on USS Enterprise, Farewell… and Hail! Stories Best Told Using Your Hands! To submit your photos, videos and suggestions for "The Daily Briefing" please send us an e-mail at thookassn@aol.com. On 27 June 2015, the U.S. Navy launched its final EA‑6B Prowler sortie from NAS Whidbey Island, Washington. This seemingly routine hop closed the book on what has been 44 years of operational success and pride. Dating back to the Vietnam War, and as recently as late 2014, Navy Prowlers proved themselves, taking the fight to the enemy. Whether target sets included surface‑to‑air missile (SAM) sites or terrorist early warning networks, Prowler aircrew and maintainers met their challenges with a “can do” spirit that embodied the best of American resolve and innovation. When BuNo 163890 reported “safe on deck” for the final time, it closed a chapter of Naval Aviation history. While carrier‑based electronic warfare dates to World War II, it wasn’t until the Vietnam War that electronic attack (EA) as a singular and dedicated mission came into its own. Faced with an ever‑improving North Vietnamese air defense network, American military authorities recognized the need for dedicated platforms capable of disrupting and denying radars responsible for guiding lethal anti‑air missiles and targeting artillery rounds. Having just transitioned to the EKA‑3B, an electronic warfare‑modified version of the A‑3B Skywarrior (more affectionately known as the Whale), the NAS Alameda‑based VAW‑13 Zappers made their first deployment to Southeast Asia in 1967. Later, VAW‑13 would be split into six separate squadrons, designated VAQ‑130 through ‑135. Simultaneously, the U.S. Marine Corps began testing and flying a modified version of the A‑6 Intruder named the EA‑6A. The A‑6 and EA‑6A lineage would eventually lead to the development of the four‑seat EA‑6B Prowler. On 25 May 1968, Grumman Aircraft Company flew the first EA‑6B. This test platform, known as M‑1, was a modified and elongated A‑6 air‑ frame. The first “from scratch” Prowler was delivered to VAQ‑129 Vikings at NAS Whidbey Island 29 January 1971. The union between EA and the Pacific Northwest was forged. By the end of the year, VAQ‑132 Scorpions arrived NAS Whidbey Island from NAS Alameda to begin accepting air‑ craft and training for the EA‑6B’s maiden combat deployment. By the end of 1974, VAQ‑130, ‑131, ‑133, ‑134 and ‑135 joined the Scorpions at Whidbey and successfully transitioned from Whales to Prowlers. Despite the draw‑down of combat operations following the Vietnam War, the EA community remained extremely active. The VAQ‑136 Gauntlets and VAQ‑137 Rooks stood up as the first new Prowler squadrons (i.e., not previous EKA‑3B squadrons) in 1974. Notable aircraft upgrades came in the form of the Expanded Capability (EXCAP) and subsequent Improved Capability (ICAP) suites. VAQ‑135 Black Ravens were the first to deploy with ICAP aircraft in 1977. That same year, the Marine Corps transitioned from the EA‑6A Intruder to the EA‑6B Prowler, with the VMAQ‑2 Playboys leading the way at MCAS Cherry Point. In February 1980, the VAQ‑136 Gauntlets made a permanent homeport change to Naval Air Facility Atsugi, Japan. The Gauntlets served with CVW‑5 as the only permanently forward‑deployed Prowler squadron until their return to Whidbey in early 2012. Of note, the Navy initially purchased only 50 Prowlers. However, with the successes and operational impacts achieved in the community’s first decade, a different course was set that eventually led to 170 Prowlers. The increased plan led to the establishment of VAQ‑138 (1976) through VAQ‑142 (1988). The 1980s saw Prowlers deployed across the globe supporting routine presence and deterrence missions, as well as crisis response strike missions. Prowler squadrons provided increasingly sought‑after services to improve aircraft survivability and strike lethality across the Mediterranean Sea, in Lebanon and Libya, as well as the Persian Gulf. In April 1986, VAQ‑135, ‑137, ‑138, and a detachment from USMC VMAQ‑2 proved invaluable in cooperatively suppressing Libya’s robust air‑defense network, comprising surface‑to‑air (SA)‑2, SA‑3, SA‑6, SA‑8 and long‑range SA‑5 missile systems. This conflict also marked the first employment of the AGM‑88 High‑speed Anti‑Radiation Missile (HARM) that would soon become another arrow in the Prowler’s quiver. It was a testament to the Prowler crews’ professionalism, bravery and skill. Following the Iraqi invasion of Kuwait in 1990, American forces massed in the Persian Gulf region as part of Operation Desert Shield, and later Operation Desert Storm. This deployment included VAQs 130, 131, 132, 136, 137 and 141 as well as shore‑based Marine Prowlers from VMAQ‑2. The lengthy build‑up and march toward war allowed squadrons to fine‑tune and adapt existing tactics to best counter the Iraqi air defense network. Before sunrise 17 January 1991, dozens of Prowlers unleashed a torrent of jamming and HARM to support U.S. Air Force F‑117 strikes aimed at crippling the Iraqi command and control structure. Official Navy reports claim that 80 percent of HARM fired in the initial attack came from USN aircraft. The central nodes of the Iraqi air defense network were dismantled within the first hours of war. For the remainder of the campaign, Prowler crews focused their efforts against point‑defense SAMs that resorted to “firing blind” due to Prowler jamming effectiveness. Desert Storm marked the first time (but certainly not the last) that Prowlers became mission “go/no go” factors. Strike pilots who watched SAMs wander off into non‑threatening trajectories quickly realized who and what to thank for their safety! The 1991 version of the Iraqi air‑defense network was the most sophisticated array the Prowler had faced to date, and yet in a matter of hours the network was neutralized. Years of research and investment in EA capability had paid off not only for the Navy, but for the entire Joint air warfare enterprise —and the work wasn’t done. Following the March 1991 cease‑fire, coalition partners began to enforce a southern no‑fly zone to protect certain elements of the Iraqi civilian population. This effort was eventually branded Operation Southern Watch (OSW). In 1995 the USAF chose to retire the EF‑111 Raven, based on Department of Defense’s (DoD) analysis of the effectiveness of the EA‑6B during Desert Storm, leaving the Prowler as the only tactical electronic attack platform in the DoD inventory. Now officially deemed a “low density/high demand” asset, the Prowler’s workload increased again with the initiation of Operation Northern Watch (ONW) in 1997. Whidbey‑based VAQ squadrons racked up an incredibly high operations tempo (OpTempo) flying OSW and ONW missions, supporting strike aircraft during United Nations efforts. By the time direct support strike missions resumed in 1998 with Operation Desert Fox, Commander, Electronic Attack Wing, Pacific (COMVAQWINGPAC) provided four expeditionary squadrons: VAQ‑128, ‑133, ‑134, and ‑142, all of which deployed to air bases in Saudi Arabia and Turkey. Beginning with Operation Deliberate Force, which led to Operation Allied Force in 1999, the Prowler and its crews were once again called upon to underwrite the lives of fellow American and coalition airmen. Due to the requirement for jamming, COMVAQWINGPAC developed a plan that kept a minimum of four Prowlers airborne, 24 hours a day, for nearly three months. In order to accomplish this task, Prowlers (operating from Aviano Air Base, Italy) including VAQ‑134 Garudas VAQ‑140 Patriots, VAQ‑138 Yellow Jackets, VAQ‑142 Gray Wolves, VAQ‑141 Shadowhawks and Reserves from the VAQ‑209 Star Warriors, adopted a circular pattern of eat, plan, brief, fly, sleep, repeat. Demonstrating “all hands on deck” community involvement, augmented by crews from VAQ‑129 (the Fleet Readiness Squadron) and the Electronic Attack Weapons School deployed to provide additional support. By the end of the campaign, no other aircraft had flown as many sorties as the Prowler. Serbian air defense system operators were a savvy and courageous foe, and because of their chosen tactics, they took high quality SAM shots against allied aircraft — but in the end, the results were familiar. As was the case eight years prior in the skies over Iraq, strike pilots frequently observed SAMs fail to track (or lose track). The reason rested in the Grumman EA‑6B aircraft from Bethpage, New York. One threat in particular, the SA‑6 Gainful missile system, was protected by the EA‑6B’s aircraft mission systems. On 11 September 2001, the VAQ‑141 Shadowhawks were on their way home from participating in the Southern Watch no‑fly zone when the strike group was immediately rerouted to the North Arabian Sea for a mission whose details were still being fleshed out. One of the biggest questions for air wing planners centered on what, if any, former Soviet air defense systems had been left in Afghanistan. If so, were any operational? As it turned out, the threat from SAMs was minimal, so the primary focus shifted to communications jamming. The VAQ‑137 Rooks arrived in theater a few weeks later and brought with them a new technology, night vision goggles (NVGs) that changed the way the community deployed and fought. These situational awareness building tools would prove critical when the Rooks sent Prowlers ashore where aircrew would begin to operate from austere airfields in Afghanistan. vaunted Iraqi “super missile engagement zone” surrounding Baghdad proved to be no match for EA‑6B crews flying from the Gulf, Eastern Mediterranean and various regional expeditionary airfields. Coordinating with national strategic assets, Prowler crews participated in strikes against some of the most heavily defended targets of the war. Jamming early warning and acquisition radars had been the bread and butter of carrier‑based tactical electronic attack for nearly 30 years, but everything changed as conditions within Iraq continued to deteriorate. By 2005 there were very few aviators, Naval or otherwise, who didn’t recognize and appreciate the value of flying with a Prowler nearby. Through insightful and innovative work by professionals at the Johns Hopkins University Applied Physics Laboratory, the Electronic Warfare Database Support command at NAS Point Mugu and the Whidbey‑based Electronic Attack Weapons School, Prowler crews adapted their Tactics, Techniques and Procedures to a new threat target set and were able to provide direct support for coalition ground troops in the form of radio‑controlled improvised electronic devices (IED) suppression. New transmitters were designed and fielded specifically to counter this emergent and surprisingly low‑tech, yet extremely lethal enemy threat. Within months of introducing this capability, Prowler aircrew provided ground commanders real‑time data in Afghanistan to coordinate movement of convoys along ground routes. A variation of this capability was employed against enemy targets in Iraq with similar success. The protection offered to friendly ground forces was in high demand, and the resultant community OpTempo was high. Therefore, Navy Reserve Prowler Squadron, VAQ‑209 Star Warriors, were called to complete four deployments to Afghanistan and one to Al Asad Air Base, Iraq. Expeditionary squadrons were on a six‑month on/six‑month off deployment cycle with gaps in EA‑6B coverage being filled by split site operations from deployed carriers and gap fills from nondeployed carrier air wing Prowler squadrons during turnaround. Counter‑IED missions made up a large portion of Prowler tasking in the years following 9/11, but other equally important tasks included support of high visibility special operations missions and the denial of enemy communication networks. In fall 2014, the VAQ‑134 Garudas completed the final Prowler deployment from the deck of George H.W. Bush (CVN‑77). Despite flying some of the oldest aircraft in the air wing, Garudas EA‑6B Prowlers remained one of the most sought after airborne assets in theater. For 44 years the Prowler community answered the call, as a member of the Naval Aviation enterprise. Operating with some of the oldest aircraft in the Naval inventory was never a crutch, rather, the quirks and nuances of maintaining these aircraft only served to demonstrate the Sailors’ outstanding dedication and true professionalism. Refusing to allow the shadowy nature of their mission to obscure their relevance within a larger Joint warfighting mission, Prowler aircrew, maintainers and support personnel routinely thought beyond the possible and worked tirelessly to provide innovative and successful answers to enemy threats. Attack, strike fighter and convoy commanders invariably included an EA‑6B Prowler on high threat missions, validating mission success. To fully appreciate and understand the Prowler’s legacy to Naval Aviation, one must look beyond operational histories and sortie counts. Statistics read well, but the real account of a community’s success is measured by its people, relationships and the kind of enduring bonds that transcend individual accolades. From triumphant fly‑ins and homecomings to somber memorial services and eulogies, the Prowler community looked inward for strength and resilience. On 14 November 2014 the VAQ‑134 Garudas catapulted from USS George H.W. Bush (CVN‑77) (GHWB) for the last time in the EA‑6B Prowler, a legendary electronic warfare platform that has served the U.S. for more than 44 years. Happy to be home at NAS Whidbey Island and proud to have flown the Prowler in its last deployment, the squadron had been deployed aboard the GHWB with Carrier Air Wing Eight for nine and a half months. The Garudas, in conjunction with U.S. Marine Corps Prowlers from VMAQ‑3 Moon Dogs, flew electronic warfare mission in the opening months of Operation Inherent Resolve and conducted missions on the first day of strikes into Syria against IS militants. The Garudas return marked the end of the last U.S. Navy EA‑6B aircraft carrier deployment, but the Prowler will continue to serve the USMC until 2019.